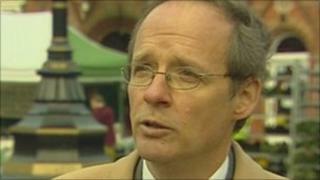 New supermarkets can have a devastating "domino effect" on local communities, a Lincolnshire campaigner has said. Nick Louth, of Keep Louth Special, said the loss of a single local trader could drive shoppers out of town centres. His comments come as BBC research reveals the number of planning approvals by Tesco, Asda, Sainsbury's and Morrisons in the past two years. These include all types of new outlet, such as small high street convenience stores. Local authorities around the UK were asked how many planning applications had been successful in the two years from 1 November 2008, including those for existing buildings which had already been in use as shops. Not all councils responded but out of those that did, at least seven stores were given the go-ahead in Lincolnshire. Of those, three were approved by Lincoln City Council and three by East Lindsey District Council. These are relatively low numbers compared to other parts of the UK. In Glasgow, for example, 22 were approved, while 12 were successful in Leicester. However, campaigner Mr Louth claimed it often takes only a single supermarket to disrupt local trade. He said: "If you go to a small shop you might also have to go to a number of different ones. "If you're buying some cheese, then you might want to buy some bread, some tomatoes - these things go together. "And if one of those shops closes, perhaps if it's been made uneconomic by a supermarket... then you might have to start going to the supermarket for vegetables. "While you're there, you might end up buying the bread and the cheese as well, so not just the shop that has closed is hit, but the others also start to fall." Keep Louth Special was formed in 2008 to protect the market town's "profusion of historic individual shops", according to the group. Responding to the BBC's research, the "big four" supermarkets said decisions about new stores were made in the interests of their customers, and had created thousands of jobs across the UK in recent years. Sainsbury's said it had a strong track record of regenerating areas that had suffered from a lack of investment, while Asda said it offered "real choice" which had been welcomed by many communities. Tesco said it worked with small, regional suppliers, and said supermarket growth continued at a steady pace, with no unprecedented change. Morrisons said it placed an emphasis on fresh food and was under-represented in many parts of the country. Asda said it had fewer stores than the other supermarkets, adding that some local communities had launched campaigns to bring Asda to their town.